Those who know Auntie Vicky™ know she does not much care for one-cup pod coffeemakers. Sympathetic as she is to those who use them in a setting with multiple users with different tastes and schedules, such as an office, she finds them wasteful, environmentally unfriendly, and thinks the coffee they produce is often less than stellar. But what then, you ask, is one to do when one wants just once cup? Auntie Vicky thinks the simplest solution is a single-serve French press coffee maker. Here’s what you need to know if you decide to try one. 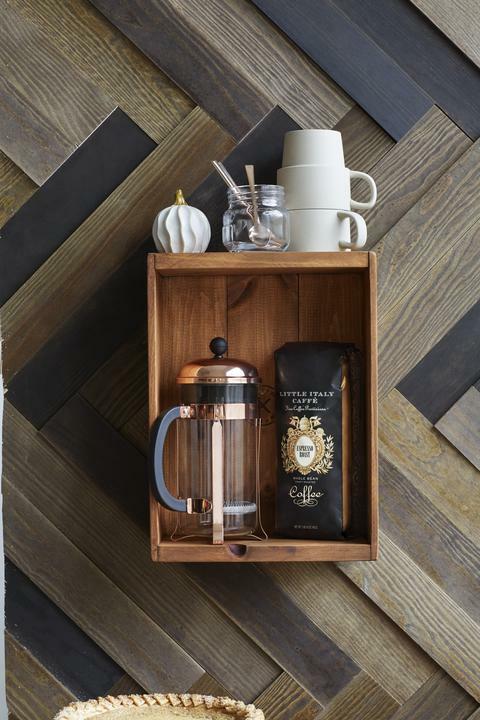 Ideally, you’ll start with fresh beans ground just before you make the coffee. But if you don’t, it’s not like the Coffee Police are going to arrest you. Whatever you use, though, should be a fairly coarse grind. 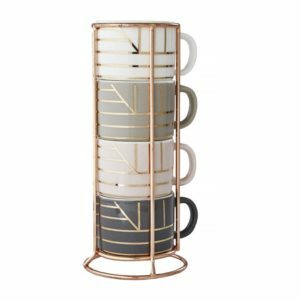 Stackable espresso cups from HomeSense save space in the coffee corner. Pour freshly boiled water over the grounds and let sit for a minimum of three minutes. #AroundtheHouse, we use a rounded tablespoon scoop for every mug of water, and typically let it brew for about six minutes. Plunge gently, please. Drink the coffee right away or, if you are using a multi-cup press, put it in a thermal carafe. A good quality model will preserve the coffee nicely till at least a mid-afternoon break. Hamilton Beach’s thermal carafe keeps coffee fresh and hot. 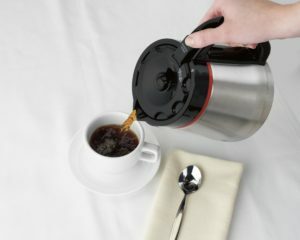 However it’s made, Auntie Vicky prefers coffee from an insulated jug than that which has sat for any period on a burner, and it’s why she’s a fan of the Hamilton Beach’s coffee maker with a thermal carafe. 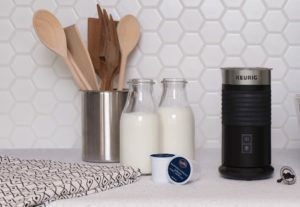 Keurig’s new milk frother is a small- footprint kitchen luxury. A frother opens up sorts of bevvy options. To that end, I have been testing a new model from Keurig. It has lots to recommend it. There’s a little ripple in the top rim that acts like a pour spout and the non-stick interior makes it easy to clean. It will steam and froth milk till it’s hot (nice for coffee and chai), and a cold function froths milks – mixed with a splash of store-bought flavoured coffee cream, if you like — for loads of recipes for iced coffee and other frosty drinks. Keurig sent me the frother to try, but did not pay for, review, or approve this content. I really did like it. And at about $100, I think it’s a very affordable luxury. Similarly, Hamilton Beach sent me a thermal carafe coffee maker earlier in the year – love it. 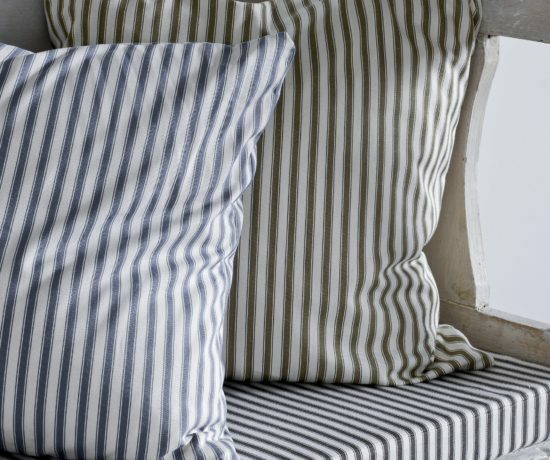 A self-confessed Opinion-ista, Vicky Sanderson has been writing and talking about décor, design and lifestyle issues for almost two decades, and has tested just about every home product known to humankind. 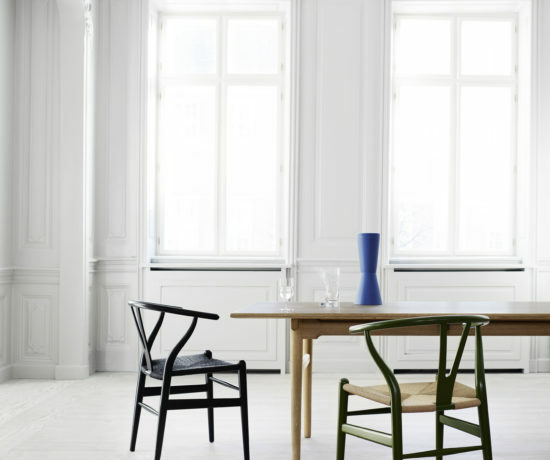 Take a seat, it’s a Wegner. Bed in a box? I get it now. © 2017 – 2018 Vicky Sanderson. All Rights Reserved.